Improve versatility of your existing 2-Post Lift! 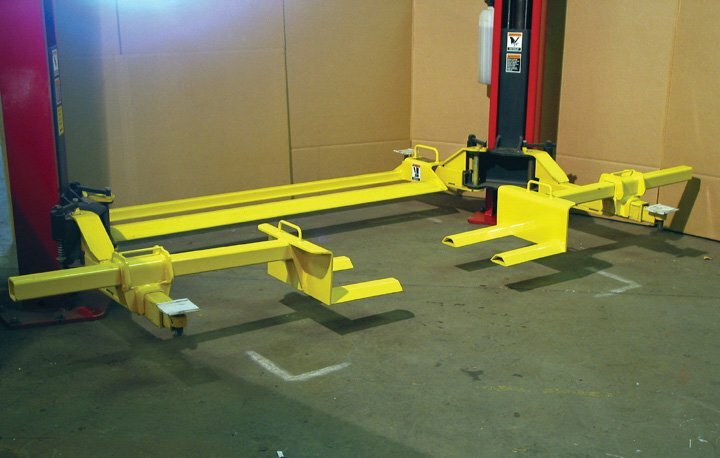 If you or your customers want to convert standard two-post automotive lifts over for turf applications, SVI can help! These Turf Attachments from SVI can be made to fit many existing two-post surface mount lifts. Call with your lifting needs and outer arm tube dimensions to get the price and delivery date. SVI is equipped to get you custom products for these turf lift accessories, among many other products. An SVI wholly-owned subsidiary was the very first ever to invent Turf Attachments for use on automotive lifts. On September 9, 1997 SVI’s very own MLM Lifts and Manufacturing (formerly known as Manitowoc Lift) developed the very first production drawings for a Turf Equipment Lifting Accessory. This innovative product line has allowed thousands of lift owners to convert their automotive lifts into a multi-functional tool. This allows for both service of their cars and pickup trucks, but also ease of repair access to all the turf and small maintenance equipment also found in and around their shop. 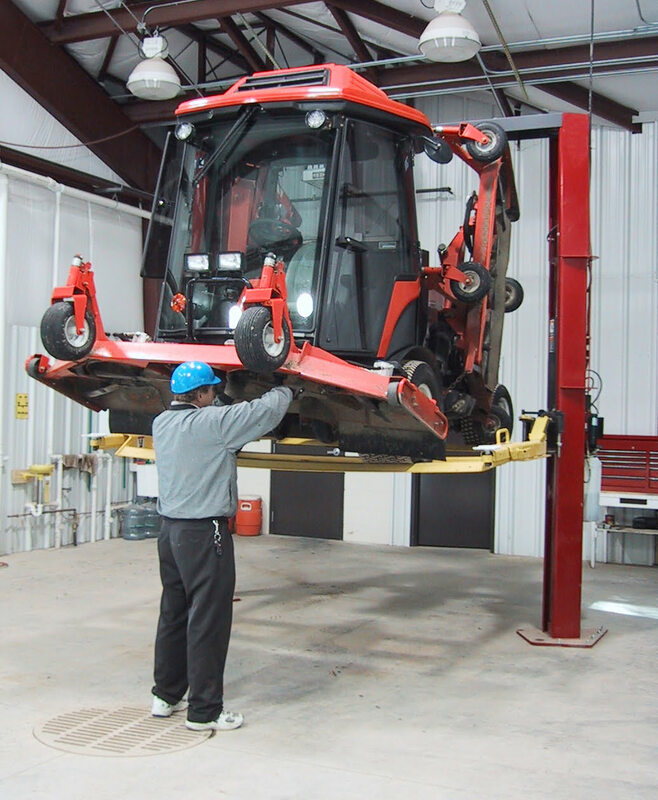 Turf Attachments are an ideal tool to incorporate into any shop that has a two-post automotive lift that also has the need for servicing all types of other equipment. Turf Attachments are ideal for park districts, golf courses, outdoor power equipment dealers, municipalities, ATV dealers and just about anywhere else that requires more versatility from their lifts. SVI has emerged and remains the leading supplier in its field for turf / utility attachments. The nimble nature of SVI engineering and strong focus on customer service allows for a wide range of flexibility in producing attachments to fit virtually all makes and models of two post surface mount lifts encountered in the field. Be sure to also check out SVI's Turf Tray Jacks. Put the SVI team to work for you today, attachments can be made for any two post lift including those with true asymmetric or triple stage swing arms. For a whole variety of turf / utility attachment solutions—SVI is your Answer! SVI is a family-owned business out of DeKalb, Illinois USA. Great pride is taken in the job we do, as SVI is an America-First enterprise. We support American jobs, American craftsmanship, American engineering and all the companies worldwide we can proudly call our customers. SVI is known in the automotive shop industry for personable service and custom products, along with an extensive inventory of repair parts for automotive lifts and shop equipment repair parts. Become a fan of SVI and add to our growing list of wonderful testimonials from satisfied customers. Call today for your Turf Lift Attachment needs!